The Falkland Islands Wolf also known as the Antarctic Wolf was the only land mammal native to the Falkland Islands. 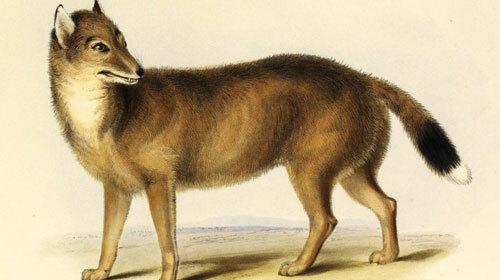 Although the name ‘Falkland Islands Wolf’ suggests a mammal similar to a wolf, research that took place in 2009 has proven the Falkland Islands Wolf to be closer genetically to a fox and specifically the Maned Wolf which is a fox-like canid found in South America. The Falkland Islands Wolf is described as having a tawny colored coat with a white tipped tail. Not much is known about the ecology of the Falkland Islands Wolf but it is believed that the Falkland Islands Wolf made its home in burrows similar to a fox and had a diet made up of insects, geese and penguins due to the lack of rodents on the Falkland Islands. 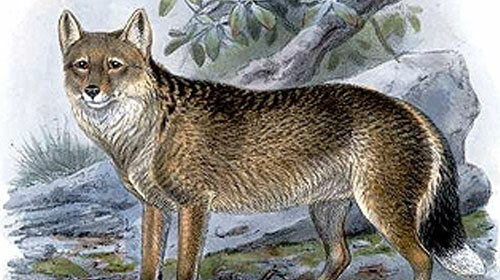 1692 is recorded as the year the Falkland Islands Wolf was first described as witnessed by Captain John Strong. Captain Strong captured a Falkland Islands Wolf and tried to bring it home on his voyage back to Europe, however the Falkland Islands Wolf became startled at some point, most likely due to cannon fire and jumped overboard. In 1833 Darwin described the Falkland Islands Wolf as tame an common on the islands and it was the tame nature of the Falkland Islands Wolf that contributed to its extermination. As the Falkland Islands Wolf had no natural predators it wasn’t instinctively afraid of humans making the Falkland Islands Wolf an easy target by new settlers who believed the animal to be a threat to their sheep. The Falkland Islands Wolf was seen as a pest by settlers of the New World and was shot on sight, poisoned and even lured into trappings. These methods of extermination were extremely effective due to the Falkland Islands Wolf’s curiosity and the lack of woodland where they could effectively hide from danger. The last known Falkland Islands Wolf was a live specimen that was taken to the London Zoo in 1868. This specimen unfortunately only survived a handful of years and thus the species was formally declared extinct. i wish they were still here! i would have done anything to save them!